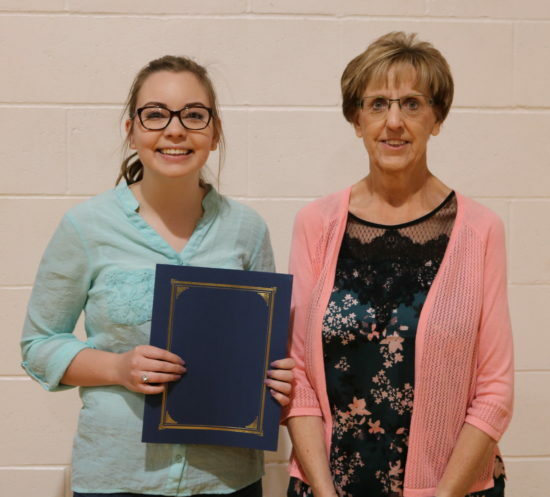 Nebraska Christian held its annual Academic Excellence Celebration (formerly known as Awards Chapel) on Wednesday, May 9. The morning began with a scholarship presentation by Kathy Furher from Cornerstone Bank. Each year, Cornerstone awards a $1,000 scholarship to a graduating senior. This year’s recipient was Danae Burdett. Another special scholarship was given out, this time to two underclassmen. The Mary & Victor Snell Scholarship is intended for students who are continuing their education at Nebraska Christian, and it is administered by the NCS Foundation. Foundation Director Jody Heuermann was on hand to present the scholarship. 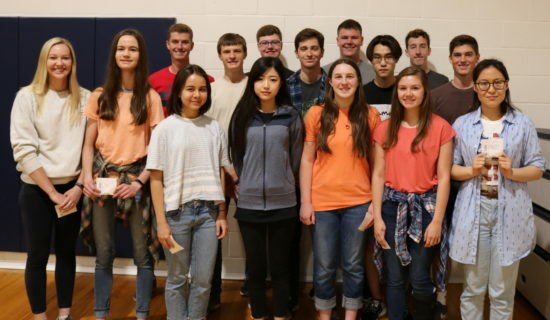 Each year, the Goldenrod Conference names seniors who received a 26 or higher on the ACT (1760 or higher on the SAT) to the Academic All Conference Team. Out of the 11 schools in the Goldenrod Conference, 24 students qualified for the academic team, and eight of those students are from Nebraska Christian. Those receiving medals for scoring a 30 or higher (1980 or higher SAT) were Danae Burdett, Brennan Nokelby, and Sam Twogood. Those receiving certificates for scoring a 26 or higher (1760 or higher SAT) were Corryn Falk, Andrew Feely, Jessica Hilderbrand, Anna Musgrave, and Micah Smith. Conference Academic Team Members. Front: Jessica Hilderbrand, Corryn Falk, Danae Burdett. Back: Sam Twogood, Andrew Feely, Micah Smith, Brennan Nokelby, Anna Musgrave. International Program Director Gib Killion presented the TOEFL award to international students who received high scores on the TOEFL test. 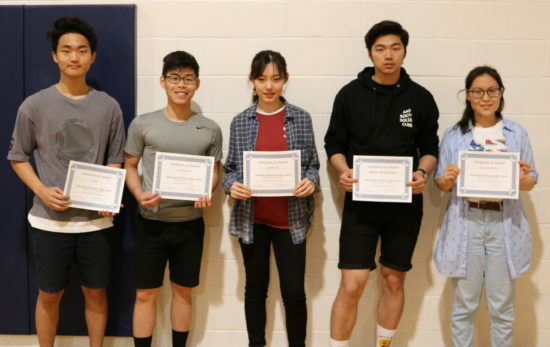 Ji Ha Kim, Nick Vuong, Bella Yin, and Richard Zhao received a silver award for scoring an 85-99, and Arwen Zhang received a gold award for scoring over 100. TOEFL Award Winners JiHa Kim, Nick Vuong, Bella Yin, Richard Zhao, and Arwen Zhang. All students who received academic letters for a GPA above 3.33 for the first three quarters were recognized. Those on the highest honors honor roll, which is a GPA between 4.16 and 4.33, received special recognition. Students on the Highest Honors Honor Roll. Front: Talia Parlane, Sharon Yu, Olivia Janssen, Kendyl Jividen, Arwen Zhang. Middle: Ali Winsterman, Jordan Schnell, Ben Janssen, Curt Bailey, Sam Qu, Jake Twogood. Back: Sam Twogood, Christopher Needham, Seth Hower, Jon Dockweiler. 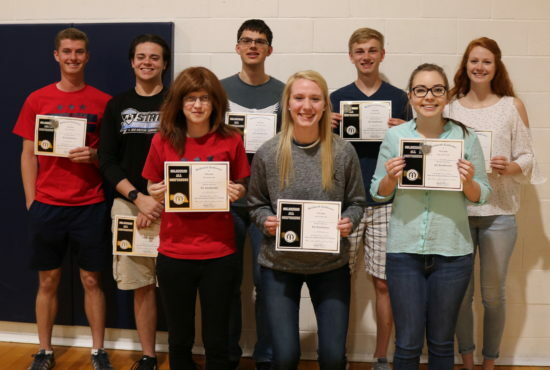 Other students recognized during the event were the quiz bowl teams, new National Honor Society members, those who received perfect attendance, and students who competed in three sports all four years of high school at Nebraska Christian. The event ended with the presentation of the Shield Award to seniors Sam Twogood, Brennan Nokelby, Claire Ostrand, and Corryn Falk. This award is given each year to the top male and female athletes who excel in athletics and display strong Christian character. 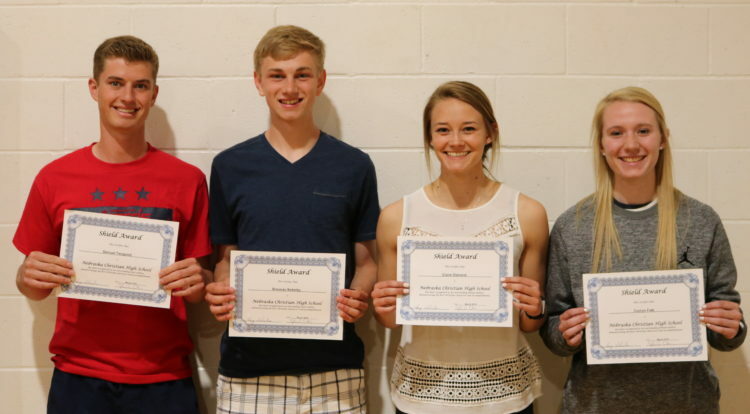 Top Photo: Shield Award winners Sam Twogood, Brennan Nokelby, Claire Ostrand, and Corryn Falk.